The Lexus performance division is young, but has pumped out some awesome cars. Lexus has done well to create a reputation for itself of sumptuous luxury and unparalleled build quality. Unfortunately, these qualities typically often attracted old people, which became a big problem for the company's youth appeal. Lexus buyers were stereotypically older, and the brand wanted to do something to convince people that it could also be as cool as its German rivals in Bavaria. The letter "F" was chosen for a new performance brand because of its use during the launch of the brand's first ever flagship car back in 1989. In 2007, the IS-F was revealed to be the first F-branded model in the Lexus lineup. The car sold until 2014, and was the first true competitor to the BMW M3 to come from Japan. The IS-F was powered by a 5.0-liter V8 with 416 hp, which was a bit more than the E9x generation M3. 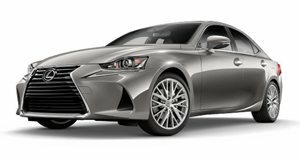 Some people prefer the overall comfort of the IS-F as well as the baked-in reliability that is true of almost every car that Lexus builds. The IS-F wasn't a world-beater when it was released, but it did offer an alternative performance car for people that preferred affordable maintenance to slightly faster lap times. These are four-door sedans after all and are often used for other duties besides lapping a race track as fast as possible. The IS-F was the first F model, but the LFA is truly the car that put F on the map. The LFA had a long and costly development that took years to complete. By the time it was released, the LFA was extremely expensive and not very competitive. Still, it is now regarded as one of the greatest sounding cars to ever be produced thanks to its glorious 4.8-liter V10 engine with 553 hp. Only 500 were ever produced, and they have just started to creep above the original asking price. Jeremy Clarkson has even referred to the LFA as the best car he has ever driven, which is high praise for the ultimate flagship from a company that everyone thought could only build boring sedans. Lexus has never been able to completely recapture the magic of the LFA, but it has taken a few elements from the car to stick on its lower models. The F-Sport line is similar to the new M-Sport and AMG-Sport ranges that are not quite the real thing. One of our favorite examples is the IS350 F-Sport. The newest IS has a radical design that was only made better in the F-Sport guise. This package adds more aggressive wheels and bodywork, as well as a sportier interior. New F-Sport models even come with the sliding, digital tachometer from the LFA, which is a nice touch. These models don't come with extra power, but have wonderful handling and dynamics that befit a true sports sedan. 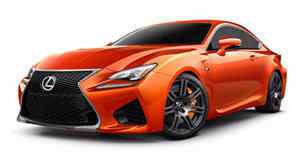 We really like the new IS, which is why we were surprised that Lexus has not yet replaced the old IS-F. Instead, Lexus decided to make its M3 competitor a two-door coupe called the RC-F. We thoroughly enjoyed our time with the RC-F, and we realized a few things while driving it. Everyone is quick to compare it to the BMW M4, when in reality it is for a different kind of buyer. RC-F owners are not interested in going to the track, they just want a good looking coupe that happens to sound really good when they mash the throttle. The RC-F does this extremely well, and is a more comfortable daily driver with more convenience features than a more expensive BMW M4. When Jeremy Clarkson reviewed the RC-F, he quickly turned a lot of people off of the F brand. He didn't like how the RC-F measured up to his expectations that it could be a more affordable LFA. The GS-F changed Clarkson's mind in a big way. 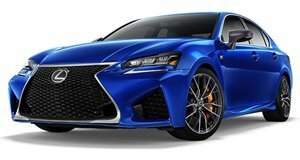 The GS-F has the same 5.0-liter V8 as the RC-F with 467 hp. This is the same basic unit that powered the IS-F as well, but the GS has a more comfortable and well-balanced chassis. The GS is one of the most underrated cars on the market today, and manages to have great comfort and driving dynamics at a cost that is much lower than its German competition.